Maybe you have heard of the Bead Journal Project or the Quilt Journal project, there is apparently also a crazy quilt journal project. For some time now, I have been a bit jealous of them and their projects. But not any longer. I'm officially starting the embroidery journal project. It's a bit informal to start with, as I don't know if it will just be me or others will be interested. And to start with, I'm running it from here. Perhaps if there are others who are serious about joining in, I will make formal lists of participants. I've made a page here on this blog for the 2012 embroidery journal project. Anyone is welcome to join in, even if you join in late. I made this project because these little black birds that live around here have an incredibly beautiful song, but you can only hear it in the spring and up to the middle of summer, then they are quiet. Attracting a mate is but one reason they sing. The little bird sitting on the branch was planned, the rest just came out as I went. I've already experimented a bit with this whole idea myself this year. The projects I am putting in this post to break up the texts a bit are my practices, if you will. There was some particular thought behind each of these that I stitched. The projects are all 4 x 4 inches. This is a size that I feel gave me plenty of room to create without being overly large. This is actually one of my store patterns, but it's me also experimenting with using a lot of colors in this style of design. The rainbow type project coloring can be a bit of challenge to get it to work right. So what is this about really? I believe there is something inside us that motivates us to choose certain themes and projects over others. We only have so much time after all. What is it that is trying to get out and what are we hoping to say? I believe embroidery is an art form. We can use it to express ourselves, perhaps even learn to understand ourselves better. When you silence the inner critic and let the stitches flow, you let your right brain have its way, and amazing things can come out. Things you just can't put into words. A fall project, of course. We have some maples on the property, they are beautiful trees. 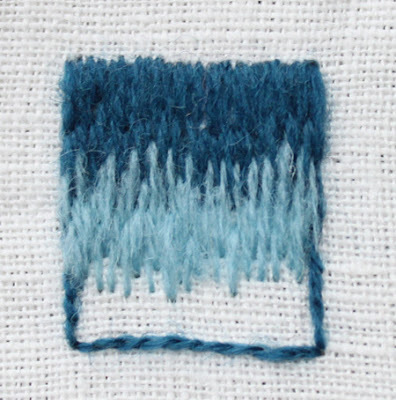 I wanted to use my summer stitch school stitches in a project, and experiment with texture. It's fun to do this type of embroidery. Of course, the leaf shape was drawn on the fabric, the stitches just came from there. Everyone has a story, everyone has different experiences. Use your embroidery to tell those stories. Let others learn from you. Each of us has our own way of making stitches on a fabric, even the same exact stitch is different from person to person. Let those be part of your story. There are really no technical requirements, just a willingness to try and share. The project can be anything, if you insist on following a pattern you of course, can, but it really is better to just pick up your fabric and make your own themes and motives. If you feel that is beyond you, then take a pattern you really like and make some effort to change or personalize it, so it's the way you want it to be. The project can be any style, it can be very definite forms and shapes or it can be free and abstract. Neither is wrong. But do take the chance to go out of your comfort zone just a little, try some new technique or new stitches. There are many ways to tell your story, perhaps a new method will open new opportunities for you. This was my first completely unplanned project. I started with letters. I knew I wanted a spring theme. Something to capture the exploding new life around me. Just one more thing to say: that is this is part of my effort to help make stitching more personal, because this is what it is about. It isn't about making perfect stitches and perfect designs. There is enough press in the world for us to all be "perfect". In addition, our personalities are getting lost in the mass manufactured culture out there. Use your crafting skills to be unique. I cut my fabrics about 1 inch bigger than the intended size. (I add about a quarter of inch around the embroidery.) I have two rectangles that I cut from mat boards, the kind used to frame pictures. Also, I use white craft glue, a piece of quilt batting, masking tap, and an exacto knife and clear ruler to cut the mat board. I first glue the quilt batting to one of the cardboards. This will be for the front. Let it dry all the way, or you risk the glue seeping out to your embroidery, and that's not so nice. Next I use the tape to attach the fabrics to the mat board. This isn't the fanciest of ways, but it works well. It can be annoying lining the design up nicely, but it's worth the time to make sure it is. I tape down the corners, then the sides. Pull firmly on the fabric, so isn't loose on the front side. If you are a perfectionist you can make perfect mitered corners. It will make the corners less bulky if you do that, but the trim can hide some of the imperfections in the corners. I do the same for the embroidered piece, using a bit more tape to hold it down evenly. Note, make sure the tape doesn't get too close to the edge or it will be hard to glue the pieces together in the next step. Next is to glue the two pieces together. Spread a layer of glue around the back side of your covered mat boards. Make sure it goes to the edges and corners, but preferably not over, especially if you plan to sew your trim in place. I put the two pieces together, then put the ornament down on a flat surface face up. I cover the embroidered surface with a folded towel, and put on some heavy books. Then let this sit until it's all dry. Now it's time to attach the trim. You can choose to glue it on or sew it on. You can use pretty much any kind of trim, yarn, ribbon, or beads that you want. In this example, I couch down some soft cotton yarn. I like to leave my stitches a bit uneven. I tuck the ends of the yarns a bit in between the two pieces to keep them out of the way. I managed to stitch 1 of 5 Nutcracker ornaments. I am hoping to do all them. This one went pretty quickly for me. I started with The Mouse King because he is the meanest of the lot and maybe that makes him the most fun! ;) I've already started the next one in the series. These are store patterns and they are fun and make great ornaments! 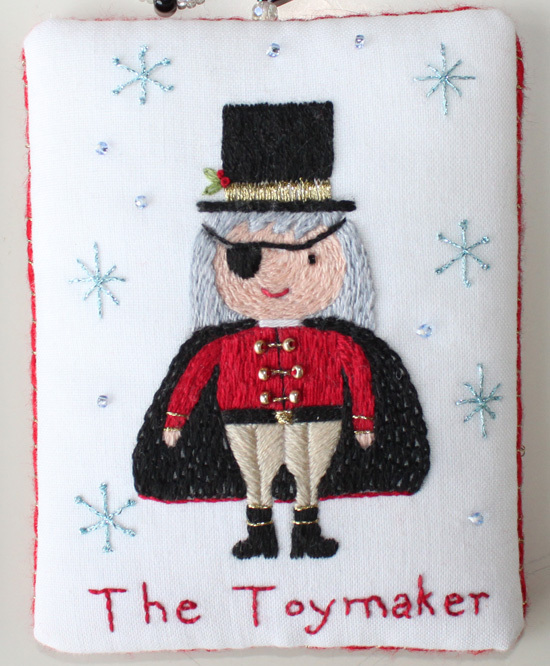 You'll find them in The Floss Box Embroidery Store. Yesterday I put in the final stitches! I took a few closeups too you can enjoy. I'm pretty happy with this project. It was a good challenge for me. 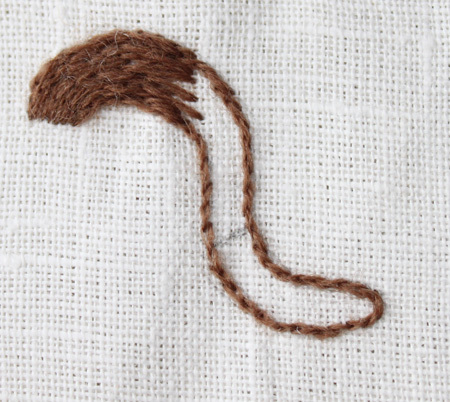 The squirrel was a bit tricky to stitch in place, but I made it work. The tail is made out of turkey knots that I trimmed and brushed out. That's a fun step by the way. It's fun to snip away the uneven strands and see things even out. The acorns and leaves were easily set in place. The berries were too. The needlelace leaves were a bit tricky since I had to push the wires through some thick stitches, but in the end it's all as it should be. The mushrooms perhaps aren't so exciting, but I really didn't want them to draw much attention from the rest of the piece. I am not sure what's next, probably a bit of Christmas stitching. You've got to start early!! This stitch is called by everyone Jacobean Couching, but everyone also seems to have another name for it, like Laid Filling or Trellis Stitch. This stitch is one of the classic crewel embroidery stitches. It creates a nice patterned filling stitch and is often used in stitching larger areas. There are three steps to this stitch, making a grid of long stitches which can be either upright or at an angle, anchoring down the long stitches at the intersections, and making a filling stitch in the grid's squares or diamonds. Actually the filling stitch is optional, but it's very common to have one. It's straightforward enough to make the grid. Making an upright grid is easiest, the diagonal grids can be a real challenge, since it's so easy to change the angles. Then make small anchoring stitches. These can be whole crosses or half or some other variation of your choosing, but they really are a must as they hold down some very long stitches. Then I just added a simple filling of french knots. I made a few other samples. The first is with a diagonal filling and a single horizontal anchoring stitch. Another option for fillings is detached chain stitches. And finally, you can do a satin stitch filling, but you stitch this first, then the grid on top of it, followed by the anchoring stitches. An example of this stitch used in a project. It's an easy way to add some interest to a larger filled area. I hope this lesson was useful! 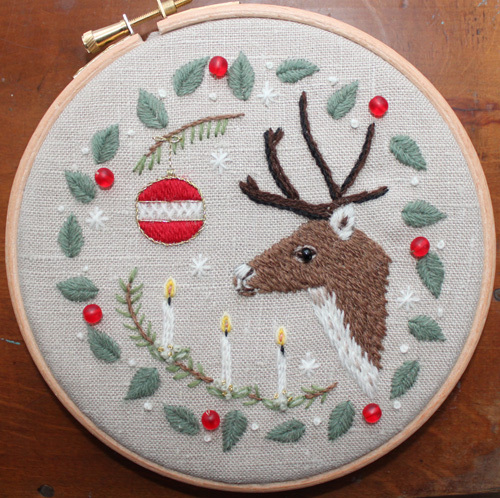 There will be a little project to stitch at the end of this Fall Stitch School lesson, so you can practice a bit of crewel embroidery yourself! Welcome to another week of Fall Stitch School. This week, we're studying long and short stitch. This stitch is troublesome for many embroiderers, but I'm hopefully going to show you that it is not any harder than any other stitch and it can be quite fun to fill an area in. Long and short is very useful not only in crewel embroidery, but thread painting as well. 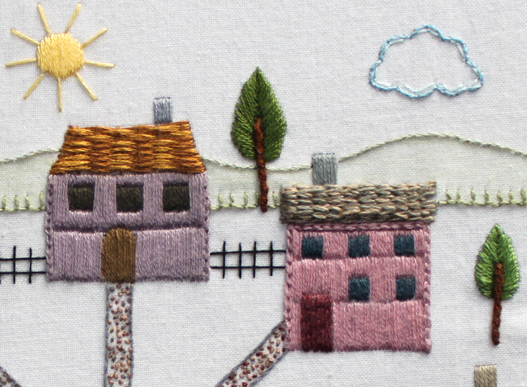 Embroiderers can achieve beautiful shading affects with this stitch. It really is worth a little practice to improve your technique and gain confidence in your abilities. The basic idea behind long and short stitching is simply to vary the starting and ending points of the stitches so that you can get a smoother color shift and to be able to easily stitch contours. I've made three sample shapes with long and short to show you a couple ways to use it. The first thing to do in crewel embroidery and (thread painting too) is to outline your shapes with split stitch or split back stitch. First shape is a basic box. The first row of stitches is composed of some longer and some shorter stitches. For the rows following, you use only long stitches (except at the end of the shape, of course), but this isn't a precise science, so the stitches will have some natural variation in length anyways. Notice my stitches aren't made perfectly even with each other. You will see that it hardly matters, in fact maybe it's better because it's so important to vary the placement. I went ahead and added another row of this color. It's very important to always, always bring the needle UP through the stitches and never down into them. The next row of stitches is started by bringing your needle up in the color above. Again you see I haven't made a perfect row of stitches. It looks a little odd in this contrived example, but in a real project, it will look fine with the variation. Start the next row bringing your needle up through the color above. This picture shows how far in you need to bring the needle up - it can be surprisingly far in. The next shape is a flower petal. Another thing to keep in mind, is that it's important to work from the outside edge inward. This example shows how you may need to change the angle of your stitches to get a nice shape. Some of the shorter stitches end up tucked under the longer stitches since the stitches are converging toward a single point and there won't be room for them all. The most challenging (and fun!) thing to do is fill complicated shapes that bend around curves. This is particularly useful when filling animal shapes. To move around a curve, you make stitches with varying starting and end points (this is really important for the making a nice filling), but the angle of the stitches changes a bit as you move around the stitch. The stitches are placed quite far up into the row of stitches above. Only a little part of each stitch is left showing, so you get a nice progression of stitches at different angles as you move around the curves. If you make the stitches a little shorter you will get a really smooth curve. Here you see all three shapes filled in. I have limited colors on hand, but I think that you can still see the potential this stitch offers.